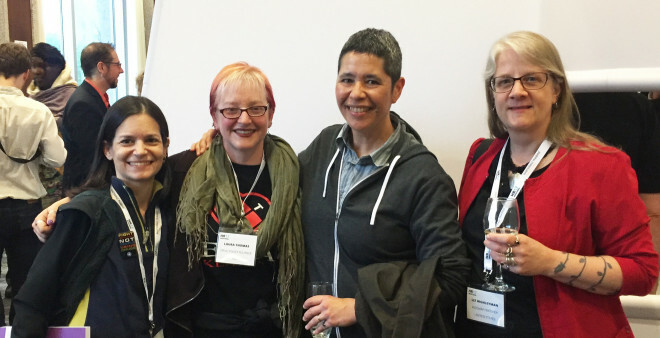 Annette, Laura, Kanani and Liz at yet another conference. Cancer today feels like AIDS in the mid-1990s. Today is the end of Lung Cancer Awareness Month and tomorrow is World AIDS Day, a good time to reflect on where we are with both cancer and HIV. Earlier this month, a friend died of non-small-cell lung cancer (NSCLC) at the age of 52. Kanani was diagnosed with Stage IV NSCLC this past June. Although the cancer had not spread extensively, she experienced some disabling complications. Her cancer didn’t have so-called “driver” gene mutations and was PD-L1 negative, meaning she wasn’t eligible for promising new precision medicine or immunotherapy approaches. This left traditional chemotherapy and radiation, which made her increasingly sick and weak. In October, she transitioned to in-home hospice care, which offers palliative care to reduce pain and symptoms. She passed away on November 10. Kanani’s story reminds me how far we still have to go in cancer research. Despite the advent of new types of treatment that work very well for a small proportion of people, her experience was similar to that of my dad, who could no longer tolerate chemotherapy and died of lung cancer fifteen years ago. This also calls to mind the U.S. AIDS epidemic in the early-to-mid-1990s. Advocates knew that effective new antiretroviral therapies were on the way, and some of us had friends who experienced near-miraculous turnarounds in clinical trials. Activists successfully pushed the Food and Drug Administration to approve promising therapies for life-threatening conditions faster -- but for many, it wasn’t fast enough. When researchers finally found the right combination of effective meds, this “cocktail” approach worked for most people with HIV. Some people with long-term AIDS were previously treated with a succession of marginally effective and toxic drugs, developed extensive resistance, and still struggle to keep their viral load down and T cells up. But for those who are diagnosed and start treatment promptly, three-drug combos usually work, modern drugs are generally well tolerated, and HIV is now a manageable chronic disease. This is even more true for hepatitis C. Direct-acting antivirals can now cure almost everyone in just two or three months -- which is not to say that everyone has access to the costly meds. But things are different with cancer. We often talk about it as a single entity, but it’s really many different diseases -- in fact, each individual patient can be said to have a unique disease profile. Some people with lung cancer have mutations that can be treated with precision therapies that target specific tumor mutations. For example, Laura Greco, featured in the Summer 2018 issue of Cancer Health, responded well to targeted therapies directed at ALK mutations and is living an active life with Stage IV NSCLC. Most people are not so fortunate, however. Around a third of patients with lung cancer have EGFR mutations and around 5 percent have ALK mutations, which have good targeted therapies available. The more common KRAS mutation doesn’t yet have a targeted drug, though several candidates are under study. Just this week, the first of a new kind of drug was approved that targets a specific gene mutation (known as NTRK) across all cancer types -- but it’s only present in about 1 percent of cancers. Some of the biggest cancer news this year was about immunotherapy for lung cancer. PD-1 is an immune “checkpoint” on T cells that plays a role in regulating immune function. Some tumors can hijack the PD-1 system to turn off immune responses. Drugs that block the interaction between PD-1 and its binding partner, known as PD-L1, can release the brakes and restore T-cell activity. But these drugs don’t work for everyone. People with higher levels of PD-L1 in their tumors tend to respond better, but this is not a reliable predictor of individual response. In order for checkpoint inhibitors to work, it appears that enough T cells must be present in the right place under the right conditions (known as the tumor “microenvironment”) and they must still be capable of mounting a response. When I report on this research at medical conferences, it’s easy to get swept up in the excitement about patients who achieve deep and durable responses to these new therapies. 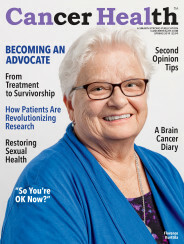 As editor of Cancer Health, we’re admittedly biased toward stories that give readers hope -- and people responding to treatment are the ones well enough to do interviews and photo shoots. Coming from the HIV and hepatitis field, I’m sometimes tempted to assume that if something works at all, it’s going to work for most people. But this isn’t the case with cancer. Like Kanani, many people do not have known driver mutations, they have recognized mutations for which targeted therapies have not yet been discovered, or they do not have biomarkers associated with response to immunotherapy. Plus, these drugs are very expensive, raising issues of equitable access. Finding new mutations and matching drugs, and figuring out how to enable more people respond to immunotherapy, are among the most active areas of oncology research. My hope is that continued advances in the coming years will make cancer as treatable as HIV -- or even better, as curable as hepatitis C -- and that these breakthroughs will be available to everyone who needs them.